The UniverSong competition is like Pop Idol, but more nationalistic. Israel has never placed highly, despite their assiduous but counterproductive efforts. 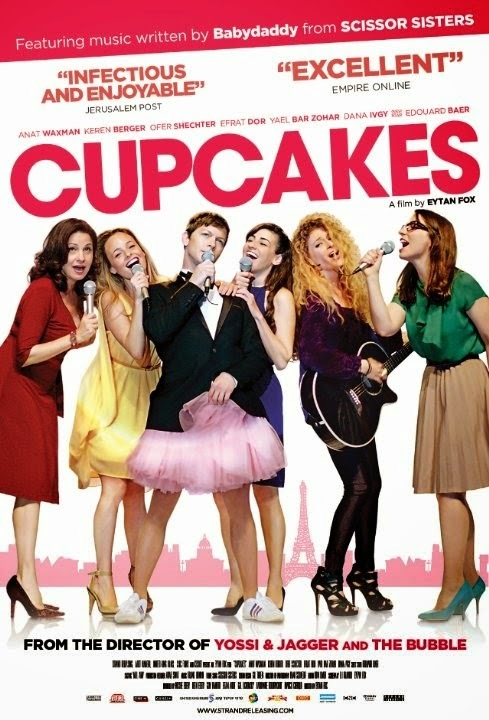 However, this year they might have an outside chance when six Tel Aviv neighborhood friends are unexpectedly tapped to represent their country—provided they stay true to their own voices in Eytan Fox’s Cupcakes (trailer here), which opens this Friday in New York. Based on the Eurovision Song Contest (which Israel has participated in since 1973), UniverSong is a big deal to for Anat, the bakery owner (care to speculate as to what her specialty might be?). Unfortunately, her husband’s sudden decision to abscond to Thailand puts a damper on her viewing party. The massive egg laid by Israel’s contestant does not help either. To cheer her up, five neighbors sing her an improvised “Sun Will Come Up Tomorrow” style ditty. It actually sounds pretty good thanks to her friends’ heart and the acoustic guitar accompaniment of lesbian alt-rocker Efrat. In fact, it sounds so good, out-and-proud school teacher Ofer submits his cell phone video to the UniverSong equivalent of the Israeli Olympic committee, who decide to think outside the box and select the amateurs. The presence of former beauty queen turned business woman Yael probably did not hurt. Of course, everyone but Ofer is initially reluctant to participate for their own reasons, but eventually all but Dana, the press secretary to the Orthodox minister of culture, comes around. Even Keren, the shy blogger (is there really such a thing?) signs on for the contest. Unfortunately, the national organizers are determined to make them as cheesy as Israel’s last crash-and-burn competitor. If you enjoy compulsively upbeat Israeli pop, your film has arrived. It is all very poppy and peppy and candy-colored, but audiences will be hard pressed to remember much by the time the closing credits stop rolling. Yet, Cupcakes is significant in one respect. It paints a vibrant portrait of Israel’s diversity and tolerance. Everyone knows Ofer and Efrat are gay and lesbian, but that does not stop anyone from rooting for him. Ofer is matter-of-factly entrusted with the nation’s young skulls full of mush, frequently putting on drag shows for his appreciative charges—with no protests. Even his difficult romance with the closeted son of the Israeli UniverSong sponsor is a decidedly low stakes issue. One of the Israeli UniverSong organizers says “we are proud of our proud contestants,” lamenting they did not have an Arab member, as well. Of course, that is hardly likely to happen given said gay and lesbian band-mates. The cast convincingly come across like comfortable friends with years of shared history together. Their casual moments together feel right. Actress-model Yael Bar-Zohar brings surprisingly rich subtlety and maturity to her ex-Miss Israel namesake, whereas Ofer Shechter over indulgences in shtick as his flamboyant namesake. Separately, Dana Igvy, Keren Berger, and Anat Waxman are a bit dull as their namesakes, but they click as an ensemble. Fox and co-writer Eli Bijaoui manage to sidestep the worst possible clichés in the third act, but they are not afraid of a little sentimentality either. It is a pleasant but hardly essentially look at contemporary Israel’s inclusiveness. Recommended for fans of Fox’s previous box office hits and Babydaddy from Scissor Sisters (who wrote the “Song for Anat”), Cupcakes opens this Friday (3/27) in New York, at the Quad Cinema.